Club Car is targeting the commercial market with the Carryall 700 and other Carryall models. Comment: Club Car has been rolling out a number of products and services over the past year or so specifically targeting commercial segments. They have launched the new Carryall vehicles, new accessories, fleet management and maintenance services and now these accessory packages. With the decline and now stagnation in the golf car fleet market, the golf car manufacturers are looking to commercial and other non-fleet markets to boost sales of vehicles as well as parts, accessories and related services. Club Car is marketing to specific verticals, which they have defined as Resorts, Education, Non-Industrial Rentals, Industrial Rentals and Government. Product display for Jake’s lift kits. Display for one of Nivel’s wheels from their GTW brand. In-store product display for Nivel’s recent brand acquisition, Madjax. Part of their strategy involves placing dedicated store displays for specific brands in dealerships. Nivel is the largest supplier of aftermarket parts and accessories for golf cars in North America. One of the booths I stopped at was Superior Enclosures. Relatively new to the market, the company has lined up their manufacturing and are ready to roll out their product in 2016. The enclosure is attached to the roof using an aluminum strip. The bottom fastener of the enclosure. The product is designed to be easier to use compared to enclosures that require rolling up and/or zipping up the sides. The Superior Enclosures work by sliding a curtain back and forth. In the closed position the enclosure is held closed by a strong magnetic strip that runs vertically along the front edge of the enclosure curtain. In the open position the enclosure curtain is held in position by button type fastener at the top and a tie-down type fastener on the bottom. Conveniently, the enclosure can be opened, closed and fastened while the person is seated in the golf car rather than stepping out of the vehicle and getting wet in the process. Another advantage is that the vertical curtain design allows water to drain down onto the ground rather than being rolled up into the enclosure. The fabric is also mold resistant. I tried out the enclosure and found the door curtains slid into place easily, the magnet held it in place strongly and you could open and fasten the curtains while staying seated. The Encompass Golf Cart Enclosure takes a different approach, using a semi-rigid door made of fabric laid over an aluminum frame. The doors open and close like a typical door but also have a clear vinyl window that can be zippered open or closed. The clear rear panel can be rolled up. The doors can easily be removed in under a minute. Also on display is the company’s golf car cooler product. Club Car is targeting the commercial market with the Carryall 700 and other vehicles as well as customer oriented service programs. Serving as a liaison between customers and engineering, product development, aftermarket and other divisions of the company. Providing regional and on-site classroom and hands-on training for mechanics, who work with actual Club Car vehicles on their sites. Troubleshooting issues for customers remotely and on site. Serving as a single point of contact for Club Car. Comment: Club Car is continuing their concerted effort to target commercial vehicle markets for sales growth. They have rolled out new vehicles as well as new services such as this support program to improve their market share. Earlier this year they launched a fleet management program. A Polaris Ranger with Glacier Pro plow system. Lithium Boost Technologies, working with Advantage Golf Cars of the The Villages in Florida, announced that they were able to get 114 miles from a single charge in an E-Z-GO RXV golf car using the LithiumBoost Ultra battery system. The Lithium Boost Technologies integrated battery system includes 200ah lithium-ion cells, 20a chargers, smart BMS (Battery Management System), and all the required wiring, gauge and accessories. Management states that the core value is in the patented BMS and individual-cell chargers system that was designed to optimize and control charging/discharging in order to yield maximum stored energy and assure long life cycle of the lithium cells. The full press release follows below the comment section. Comment: That is an impressive range for a single charge. The issue with lithium battery systems is the cost relative to lead acid battery systems. At this point, the technology appeals mostly to the higher end of the market as a replacement or option for a standard lead acid system. The golf car market is very price sensitive so the price of a Lithium based system will need to decrease significantly for widespread use to occur. 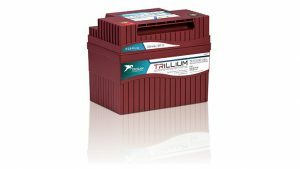 Besides the advantages of more range and less weight, there is also need for a battery pack that is less maintenance intensive then lead acid batteries. If you talk to dealers or battery companies, they frequently point to poorly maintained batteries as an issue. It can impact the sales of electric powered golf cars or LSVs because a poorly maintained battery pack can result in a premature and expensive replacement of batteries. This can reflect poorly on the vehicle manufacturer, battery manufacturer and dealer, even though the fault often resides with the owner not properly maintaining the batteries. In turn, this can lead consumers to a switch to a gas powered vehicle. San Diego, CA, and The Villages, FL, September 29, 2015 – Lithium Boost Technologies Inc., the leading provider of innovative Lithium-ion battery systems to power low speed electric vehicles (LSEV) today announced a record of 114 miles per charge achieved by its customer Advantage Golf Cars (The Villages, Florida). LithiumBoost Ultra battery system with 200ah lithium cells and 20a chargers, was installed by Advantage Golf Cars in an E-Z-GO RXV golf cart, replacing existing lead-acid batteries. After performing comprehensive tests and working closely with the Lithium Boost engineering team to enhance the battery system features, Advantage Golf Cars mechanics drove 114 miles per charge at an average speed of 17 miles per hour. This record was accomplished in one day, utilizing multiple drivers taking turns in driving each one hour shift. The Lithium Boost Technologies integrated battery system includes lithium-ion cells, chargers, smart BMS (Battery Management System), and all the required wiring, gauge and accessories for powering low speed electric vehicles. Its core value is in the patented BMS and individual-cell chargers system that was designed to optimize and control charging/discharging in order to yield maximum stored energy and assure long life cycle of the lithium cells. Based in San Diego, California, Lithium Boost Technologies Inc. provides innovative integrated Lithium-ion battery systems deploying high-quality LiFePO4 cells to power low-speed electric vehicles (LSEVs) and emerging applications. Based on its proprietary technology, Lithium Boost has built a complete performance-optimized lithium-ion system with smart BMS (Battery Management System) and chargers that allow to best harness the power of lithium-ion technology. Advantage Golf Cars is dedicated to serving the needs of their customers. The company has been in business since 1991 and has ten locations throughout Florida. Advantage Golf Cars offers the largest selection of New and Pre-Owned E-Z-GO, Cushman, Bad Boy, Club Car and XRT vehicles. Advantage Golf Cars has been a Factory Authorized Dealer for over 20 years, and in that time they have earned multiple Dealer of the Year awards. Advantage Golf Cars also rents and leases golf cars. Advantage Golf Cars has contracts in place for golf car maintenance repair, lease, or rentals with special event coordinators, production companies, convention centers, clubs, marinas and professional sport entities like the Miami Heat and the Miami Marlins.